1. Whisk together oil, sugar, and cinnamon. 2. 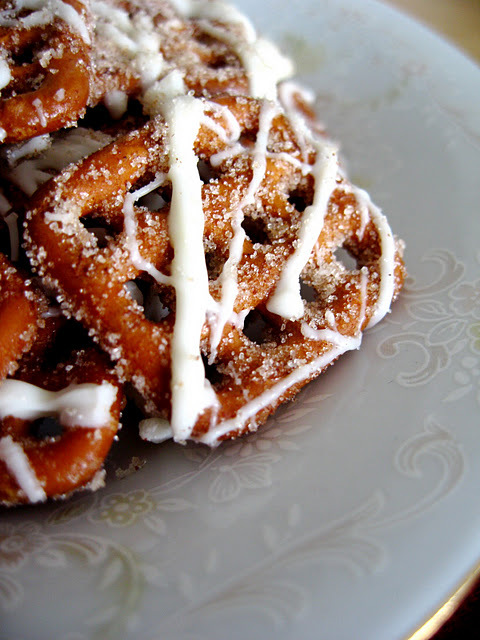 Pour pretzels into a microwave safe bowl and pour oil mixture in. Stir until coated. 3. Microwave for 1 minute, remove and stir. Microwave 45 seconds more. 4. Spread pretzels evenly onto two cookie sheets covered in parchment paper. 5. While still warm, sprinkle cinnamon sugar generously. 6. 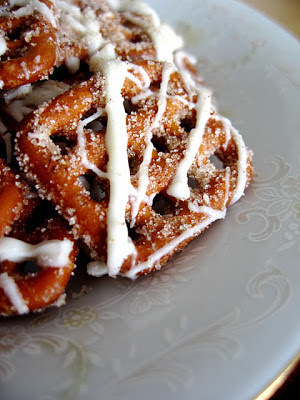 Melt white chocolate (on low heat, be careful not to burn) and drizzle over cooled pretzels.